Fr. Vazken Movsesian is a priest of the Armenian Church. For the past four decades he has melded the most ancient traditions and practices of Armenian Orthodoxy with contemporary themes to bring about the promise of peace. He is the child of Genocide survivors and understands the importance of transformation to facilitate the healing process. His work has taken him to Rwanda and Armenia to study the processes of survival via the implementation of the very basic human precepts of faith, hope and love. Fr. Vazken is an innovator. His first parish was in the dawning Silicon Valley (1982-1996). There he pastored and established the St. Andrew Armenian Church in Cupertino, California, next to the blossoming Apple Computer campus. Fr. Vazken established the first electronic bulletin board system (BBS) SAIN (1988) dedicated to the free flow of information about Armenians, the Armenian Church, Orthodoxy and Genocide studies. Since that time he has pioneered the use of modern technology to bring the message of hope and love to the world, via videos and electronic sermons. In 2000, while he was the Parish Priest at the St. Gregory Armenian Church in Pasadena, he received a grant from Japonica Partners to broadcast the Divine Liturgy on the Internet. Since that inaugural broadcast he has produced a steady stream of lessons, open forums and electronic classroom sessions designed to promote social change via patterns of love and non-violence. In 2003 Fr. 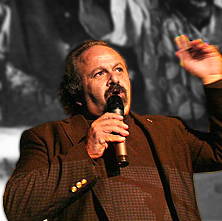 Vazken established the In His Shoes organization as a response to Genocide. He teaches that those who have suffered evil have a unique responsibility to take action against injustice to others. Based on Christ’s principles of love, compassion and repaying evil with good In His Shoes challenges people to find the terms which define us as a human race. This is a language of understanding and compassion, a language he is developing into what he has coined as Armodoxy. From 2003 to 2016 he was the parish priest at the St. Peter Armenian Church & Youth Ministries’ Center in Glendale, California, where he worked with immigrant families from war-torn countries, adjusting to the difficulties of resettlement. It was there that along with Suzie Shatarevyan he began broadcasting weekly videos and podcasts with a message of hope to a world-wide audience on the Epostle.net site. The flagship “Next Step with Fr. Vazken” is currently heard and followed on six continents, eliciting a growing response for social responsibility by practicing love, compassion, forgiveness and working for peace. His videos – Armenian Christianity Today, In Step with Christ, and AC101 were produced by the Western Diocese of the Armenian Church and provide a clear description of the Christian Church acting in modern times. All of these series are available on the Armodoxy channel on Youtube. Fr. Vazken continues to serve out his ministry as a priest of the Armenian Church in the Western Diocese. More? A personal statement, where Fr. Vazken shares his vision for his ministry and faith in a blog.